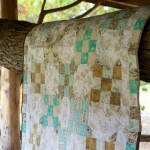 Early in my quilting adventures, I was guilty of starting many more projects than I finished. Case in point: this quilt started life in April 2011, but a block disappeared as I was piecing them into rows and I quickly moved on to newer, shinier projects. In the 43 months between then and now, the almost-completed top and its scrap fabric have migrated from box to bin to box, apartment to house to apartment. So consigned to oblivion, it wasn’t even mentioned in the unfinished projects lists in my yearly review posts of 2012 and 2013. 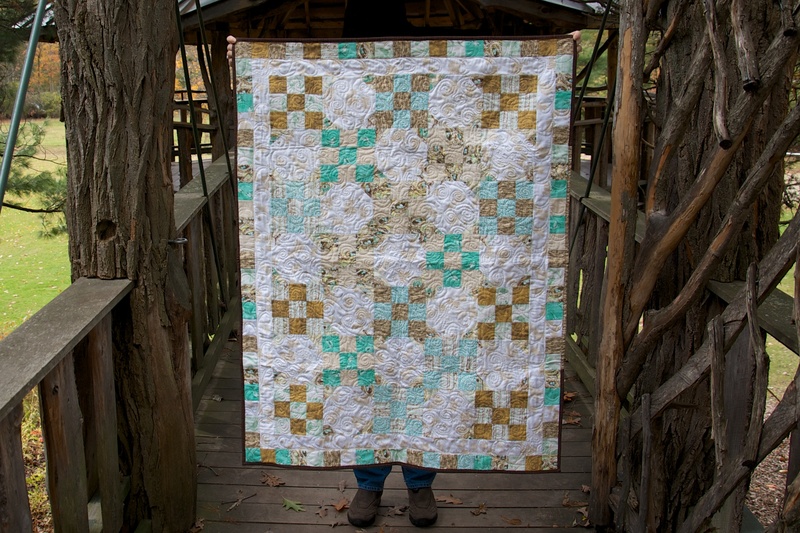 “Bird’s Nest Quilt”, Rachael Arnold, October 2014, 38″×50″. Photo by Carl Pfranger. I started the top shortly after buying a Jellie roll and the book Two from One Jelly Roll Quilts by Pam and Nicky Lintott. It’s made from alternating 6″ nine patches and snowball blocks, using 2.5″ strips and a background fabric for the snowball (in this case a Target cotton sheet set clearance buy). After one of the blocks went missing, I bought a charm pack of the fabric with which to recreate the stray block, but never followed through on piecing it. The host of unfinished projects in my sewing closet has lately become mental as well as physical clutter, demanding commitment. I unboxed this one while considering co-opting the backing fabric for another quilt you’ll see soon. 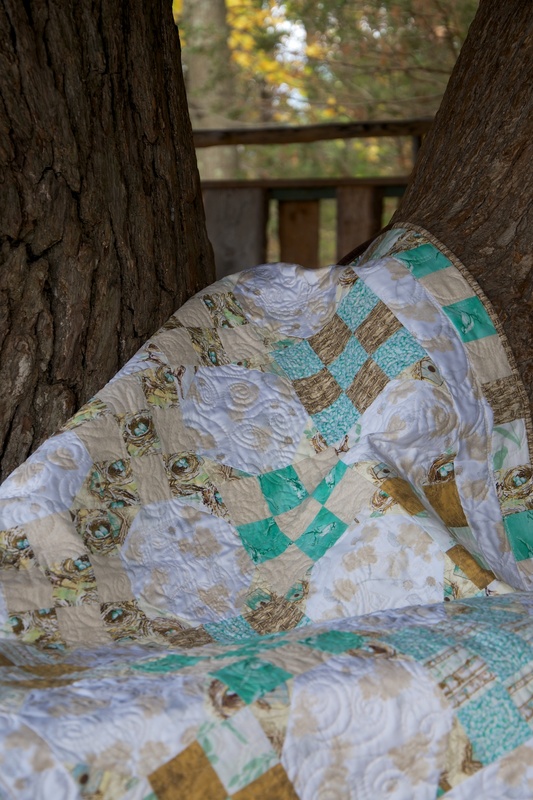 Instead, I finished piecing it while waiting for a different fabric to ship for the other quilt. When I opened the box, the missing block was there on top—found and again forgotten at some point over the years. A few seams, two borders (most of which were already pieced), and it was done in the span of an hour. I’m glad it was a simple quilt design; I de-stashed the book a year or two ago. 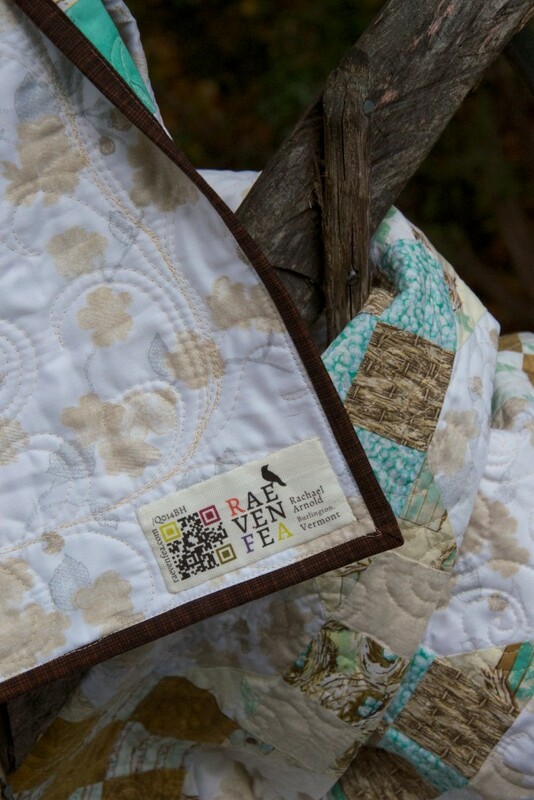 “Bird’s Nest Quilt” (detail), Rachael Arnold, October 2014, 38″×50″. Photo by Carl Pfranger. To fit the bird nest theme, I used a stashed embroidery quilting bird motif to quilt some of the snowball blocks and two of the corners. The rest of the blocks are quilted with an all-over swirl design, the borders feathered. The sheeting fabric was somewhat difficult to quilt as it didn’t glide over my machine like quilter’s cotton does, but my free-motion skills aren’t perfect anyhow. 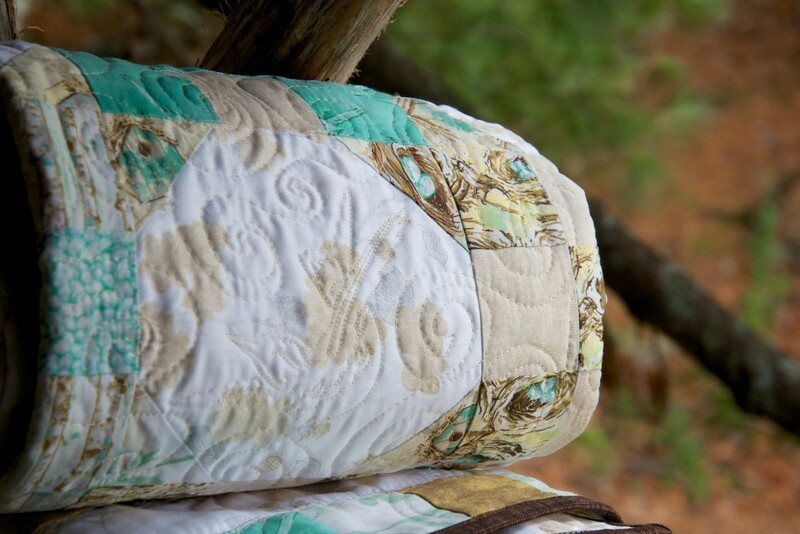 All the free motion made for quick work—it went from basted to quilted in a single evening. 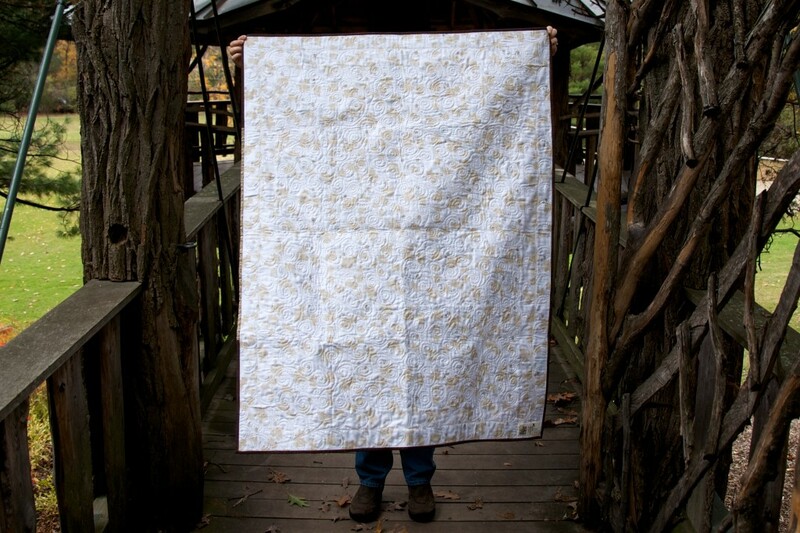 “Bird’s Nest Quilt” (back), Rachael Arnold, October 2014, 38″×50″. Photo by Carl Pfranger. And so my sixth quilt start became my thirty-second quilt finish. 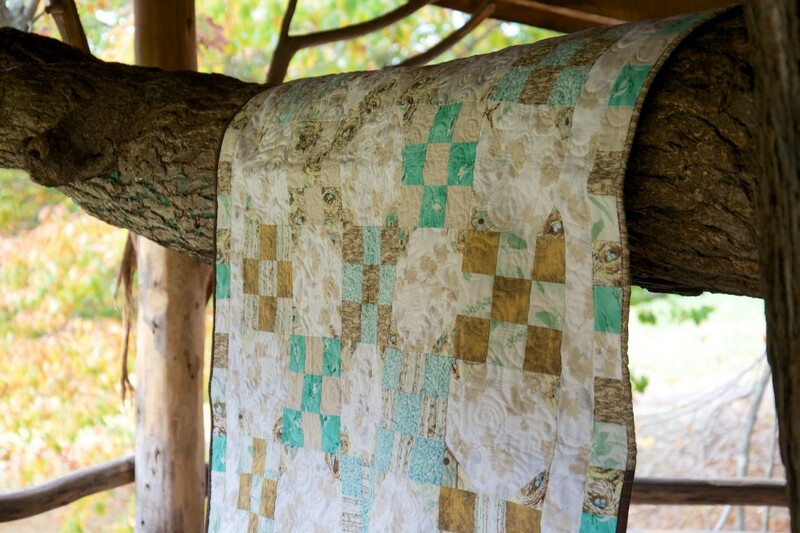 Working with the older piecing, I could tell how my skills have improved—small betterments became a substantial change that I hadn’t otherwise noticed. There’s also something to be said for ease of working with high-quality fabric instead of the cheap stuff this is made of. In the end, I didn’t need that charm pack at all, although a few charms made it into the binding when I found myself short on the brown texture. Perhaps I’ll make a pillow or two to match—I still have an entire twin sheet plus scraps of the background and backing fabric. Regardless of its future, it feels great to recover the storage space and knock another unfinished project off the list. In the realm of quilting, this is hardly an “old” project to finally finish. What’s the oldest project you’ve ever dug out of a box and finished up?